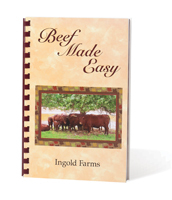 This cheesy meat loaves recipe comes from Beef Made Easy, a collection of the Ingold family’s favorite beef dishes. In a bowl, beat the egg and milk. Stir in cheese, oats, onion, and salt. Crumble beef over mixture, and mix well. Shape into 8 small loaves; place in a greased 13-inch x 9-inch x 2-inch baking dish. Combine ketchup, brown sugar, and mustard; spoon over loaves. Bake uncovered at 350° for 45 minutes, or until the meat is no longer pink and a meat thermometer reads 160°.